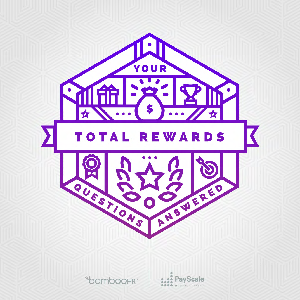 A total rewards program is made up of several elements- WorldatWork lists them as compensation, benefits, worklife effectiveness, recognition, performance management and talent development — so it’s no wonder that putting together successful packages is a complicated, sometimes stressful, endeavor. There’s so much to consider and evaluate, and if you’re like most of your HR and compensation colleagues, you have a lot of questions. Well hey — that’s what this ebook is here for. Rusty Lindquist, VP of Thought Leadership at BambooHR; Dave Smith, Chief Product Officer at PayScale and Jill Christensen, Founder of Jill Christensen Intl., recently hosted a panel discussion in which they offered insights and tips on the biggest, most frequent concerns around total rewards. What follows is a distillation of their very helpful advice on the most common related questions.